Can you establish a ritual of picking up your guitar every day? You’ll need a good reason before you do. What’s the long-term goal aside from knowing a few songs? Mind-mapping was developed in the 1970s as a whole brain alternative to linear thinking. It’s essentially a keyword technique. The idea is to write down a central theme, and then use lines growing out of that central theme to depict your thoughts and associations. This is not about categories. It’s about whatever is in the mind. What I’ve got below is a template: a broad category and then stuff coming from it. You absolutely cannot censor yourself when you do this. Judgement is never fun, and this should be fun. You can eliminate stuff later. Dream big right now. Use “music” as the central theme. Then use “guitar” as one of the first thoughts coming from that. Use things that you discover in the music theme that relate to guitar. These will likely be things you haven’t thought of before. 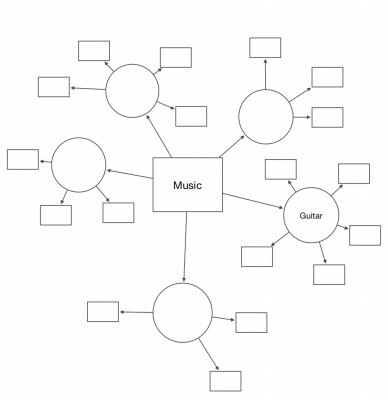 Fill in the squares surrounding the guitar circle. Add squares if you want. Fill in the empty circles surrounding the music square. Now you’ve got some ideas for what you want to do. Don’t get rid of anything. Which do you think are most realistic to start with? “Play like Eric Clapton” is possible, but won’t happen right away. Do you know what you need to know in order to do that? “Learn my favorite song” is possible sooner depending on how hard it is. “Learn a few chords” is easier than both of those. 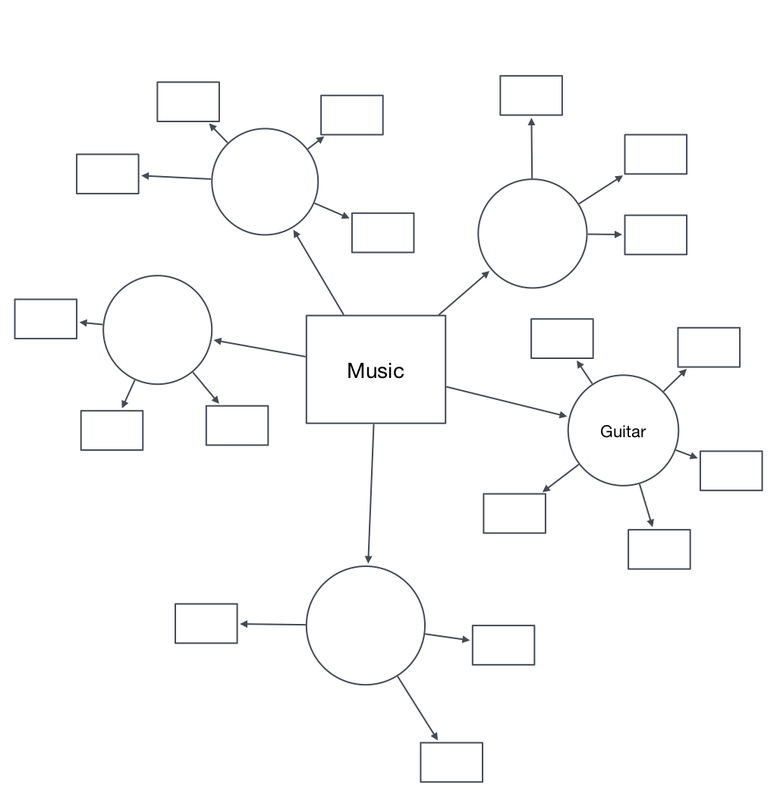 “Play with other people” is something that could happen as soon as you know a few chords, or after you learn a few song (these are just examples; none of them need to be on your mind map if they don’t feel right to you). Make a list of all this stuff. Now find a good teacher. Show her/him the list, and create a learning strategy together. What do you start with? At what point do you start working on playing like Eric Clapton? Figure out a sequence of learning and a loose timeline for when you might be able to accomplish your goals. Base those goals on 15 minutes, 6 days a week. Be realistic. If you’re not realistic, you’ll get discouraged. If you get discouraged, there’s more likelihood that you’ll quit. I don’t want you to quit. You don’t have to keep going back for lessons if you don’t want to. You can develop the plan with a teacher, and then go home and work it. When you run into a problem, go for another lesson. Be aware that some teachers don’t want to teach this way. Many require a monthly cheque for 4 lessons. This is reasonable if teaching is their sole means of income. Others teach part-time and are more flexible, so make sure you let whoever you talk to know up front what you’re looking for. Teachers are great for encouragement, and for giving you a sense of how you’re developing. Use them wisely and according to your budget. For more techniques on idea generation, check out Michael Michalko’s excellent book, Cracking Creativity: The Secrets of Creative Genius.